My good friend Bill Salus continues his prolific writing quest. His God-Engendered drive, it is obvious to those who know him, is focused on informing all who will seek Truth about Biblical prophecies given for these last of the last days. Some are calling his new book perhaps the best book on Bible prophecy yet future they have read. I certainly can commend it to you as Biblically-centered dissection of today’s issues and events as thoroughly researched and presented as any book of recent times. The author says the following about this quest to deliver God’s prophetic Message to this generation. “The NEXT PROPHECIES is book two of a projected trilogy that puts a possible chronological order to the prophetic events of the end times. 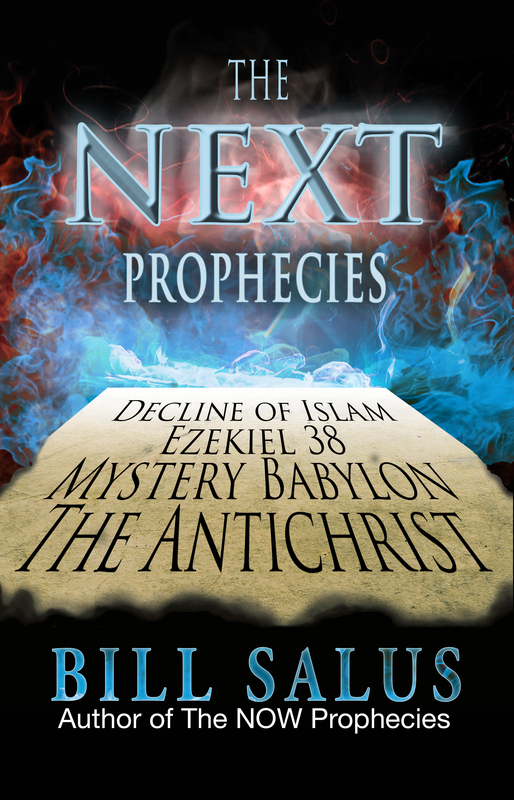 The NEXT PROPHECIES is the sequel to The NOW PROPHECIES book. The NEXT PROPHECIES will happen soon after The NOW PROPHECIES and the stage is presently being set for their fulfillment! The NOW Prophecies are the unfulfilled ancient biblical predictions that appear to be imminent, which means they could happen NOW! These foretellings have either minor or no remaining preconditions inhibiting them from happening. What distinguishes the NOW Prophecies from the NEXT Prophecies, is that the NEXT Prophecies have at least one or more significant preconditions prohibiting their final fulfillment. Although these NEXT Prophecies appear to be presently stage setting, their completion is being prevented by some other epic prophetic event, or series of events. Essentially, the NEXT PROPHECIES begin when the Church Age ends with the Pre-Tribulation Rapture. Although some of the NEXT PROPHECIES could begin in the first half of the Tribulation period, most of them begin in the gap of time between the Rapture and the Tribulation period, which is called the Post-Rapture / Pre-Tribulation time-gap in the book. The premise behind this gap, is that it’s not the Rapture that starts the Tribulation period, rather it’s the confirmation of the false covenant in Daniel 9:27. THE NEXT PROPHECIES transports the reader into the mysterious Pre-Tribulation time-gap that no man has dared to enter into before. The book uncovers what appears to be the true content of the false covenant that triggers the Tribulation period. It unveils the motivations behind Israel’s desperate need to become a signatory of the false covenant. And, it reveals the mystery of end times Mystery Babylon. Motivate Christians to live holy lives, redeem the time and evangelize. Bill Salus further writes the following. 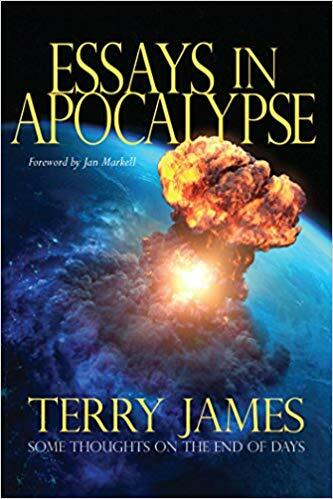 Because of the lateness of the prophetic hour, I sense that my book released just recently: “Essays In Apocalypse: Some Thoughts On the End Of Days,” is a book I’ve been commissioned to write. Satan’s assault on America as originally constituted increases daily. Human participants in the attack declare for the most part that their rage is justified. America was flawed from its beginning and has gotten its superpower status on the backs of other nation-states whose treasures it has illegally taken in one way or another. The United States was, they are taught, built on the backs of slaves; otherwise, it would never have achieved its heights of dominance. This is the rant against capitalism–against everything and anyone who champions the individual’s right to make it on his or her own. The collective–i.e., government and its ever-growing largesse–is the route to Utopia, they declare. These believe in freedom, but only in the first four letters of the concept of the word. Free stuff, they think, makes for happiness and success. The young are more and more embracing this definition of freedom. They are promised free college, guaranteed income–whether one has a job or not–and even complete freedom from financial responsibility within the technological activity they love most–social media. Polls show a growing number who would thus elect Santa Clause if they could. And there is a growing number of people within the camp of the political left who will be willing to offer themselves for such tax-and-spend positions. Within this political/ideological equivalence of primordial soup gestates the Sodom Syndrome, if I may coin that term. Satan is, in my estimation, using this insane offer of something for nothing–a free lunch–to throw in the proposition that freedom also means freedom to break from traditional American values. Further, it is incumbent on this progressive army of the young to break from all other norms held by previous generations. Their mentors–some in their seventies and eighties–are telling them they can be any gender and of any sexual persuasion they wish. Those rules are all inhibitors to true freedom and Utopian progress placed on humanity by founding fathers whose desire it was to enslave for their own selfish, racial, purposes. The devil thus has unleashed the same infection he has employed in generations down through history. Greece, Rome–all fell to such promises and nudges into breaking with truth that God set in order for His creation called man. Sodom and Gomorrah are prime examples of this insanity–the Sodom Syndrome–from which America is suffering, in my view of things that have developed as of late. My thought processes were piqued while listening to a TV preacher the other day. Some who read this commentary, I’m sure, will have heard his message, thus will recognize to whom I refer. He was talking about the current situation in America with regard to the satanic attack led by those who are attacking God’s view of righteousness. The preacher gave the story of how the men of the city of Sodom, both young and old, beat on Lot’s door demanding that he send out the two men who were in his home. They wanted to “know” them, meaning, of course, to have sexual relations with them. They said if Lot didn’t send them out they would deal worse with him than with them. The TV preacher likened this to things going on today in the volatile societal and political arena of American culture. He said that when any nation or empire becomes so full of iniquity that it is spilling over the edges, God’s judgment will fall. He–and I, incidentally–believe that cup of iniquity is indeed overflowing. The preacher said further that the men of Sodom threatened Lot–whom God called “righteous”–with extreme violence. Some of today’s movements within the “hate America and Christianity” crowds threaten and even carry out acts of violence. They will not abide righteousness, but want to do what is right in their own eyes. I’m convinced that many of these would kill those who oppose their self-willed ideology if they could do so. This is yet another indicator that America’s cup of iniquity must be filled and overflowing in God’s holy view of things. Finally, the TV preacher said that God told Abraham, Lot’s uncle, that He would spare the city of Sodom if God could find ten righteous people. He could not. The television preacher’s contention is that the righteous living in America and the world constitute the reason He has thus far spared this generation. But, he said, the warnings of impending judgment might be about to make evident God’s acknowledgement that the cup of iniquity is overflowing. God sometimes gives extremely dramatic forewarnings before His judgment is implemented. Could we be nearing the time when He will give such warning to America? My own exhortation is that all believers pray like I believe we did leading up to the 2016 presidential election. The Lord answered those prayers with what most consider a miracle in election results. Pray for God to intervene and continue to restrain the evil assaulting from every angle in our national life today. We are experiencing what I term the Sodom Syndrome. The ultimate intervention might just be that which the Lord prophesied as recorded in Matthew 24:36-42 and Luke 17:26-30. I believe that intervention to be the Rapture of the Church. The series was entitled Scanning a Fearful Future. Some of those articles were excerpted for my book Rapture Ready…Or Not: 15 Reasons Why This Is the Generation That Will Be Left Behind. There has so much taken place since the time of the publication of those essays that I sense we must once again address the prophecy Jesus gave while sitting with His disciples that day upon the Mount of Olives. It is vital, in my view, that we do so.